The most common belief is that the earth has been originated from the Sun. Some scholars propounded theories regarding the origin of the earth. ü Abraham Ortelius (Dutch) was the first to propound this theory in the year 1596.
ü Antonio Pellegrini was the second to propound the theory. 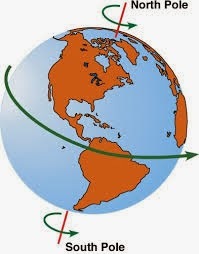 ü And finally the Continental Drift theory was proposed by Alfred Wegener (Germany) in the year 1912). About 150 million years ago there was only one continent in the World called Pangea. The Pangea was surrounded by a mega Ocean called Panthalassa. Around 200 million years ago pangea broke into Laurasia (North) and Gondwanaland (South). ü The Plate tectonic theory was propounded by McKenzie, parker and Morgan in the year 1967.
ü According to this theory the outermost part of the earth is made up of Lithosphere (Crust + uppermost part of the mantle). ü Below Lithosphere it is Asthenosphere (inner part of the upper mantle). ü The Asthenosphere behaves like superheated material over which the Lithosphere floats. ü These are also called Lithosphere plates. ü According to this theory Earthquakes, Volcanoes, mountain building and oceanic trench formation occur. ü The Big Bang Theory was propounded during 1950’s and 1960’s. ü This theory was validated in the year 1972.
ü According to this theory everything in the universe emerged from a point known as Singularity. ü The solid crust of the earth came into existence about 4.6 billion years. ü How do you estimate the age of the rocks that forms into the earth’s crust? It is through radio carbon dating. ü The radio carbon dating technique was developed by Willard Libby (USA, 1908 – 1980). ü Radio carbon dating is also called carbon dating. ü Just like any other object the earth has got a shape. ü The shape of the earth is called ‘Geoid’. It means earth-shaped. ü The real form of the earth resembles a sphere. That is compressed at the poles and slightly bulges at the equator. ü This is also known as oblate ellipsoid or spheroid. ü The bulge at the equator is because of the rotation of the earth. ü The earth moves in space in two distinct ways. (Note: Be clear with rotation and revolution. If it is not clear please read again immediately, kindly do not leave and jump to other area). ü The rotation is the movement of earth on its own axis. (Around its own self). ü The earth rotates on its own axis. 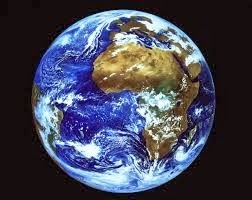 ü The total time taken by the earth for rotation is 23 hours 56 Minutes and 4.09 seconds. ü The rotation of the earth causes the formation of day and night. ü The revolution is the movement of the earth round the Sun. ü The total time taken for revolution is 365 ¼ days. (365 days 6 hours 9 minutes and 9.54 seconds). ü The revolution causes the seasons. (Did you observe that there is an additional 1/4th day? We normally say that there are 365 days in a year. What happened to the 1/4th day? Do you know what a leap year is? This is a year with 366 days with 29 days in February. This happens every 4 years. Where from it is coming? The additional 1/4th day is taken for 4 years and it becomes 1 day and it is added to the year. What is responsible for change of seasons? ü The axis of the earth is ecliptic. ü It is also called obliquity of the ecliptic. ü The earth has an axial tilt of 23.40.
ü This axis remains tilted in the same direction towards the stars throughout the year. ü This is the main cause of seasons. ü This is also the cause for varying lengths of days and nights. ü The Sun is vertically over the head of the equator on March 21st and September 23rd every year. These two days are called equinoxes. (Equal day and night). ü On June 21st the Sun is vertically overhead at the Tropic of Cancer (23 ½ 0 N). This is called Summer Solstice. 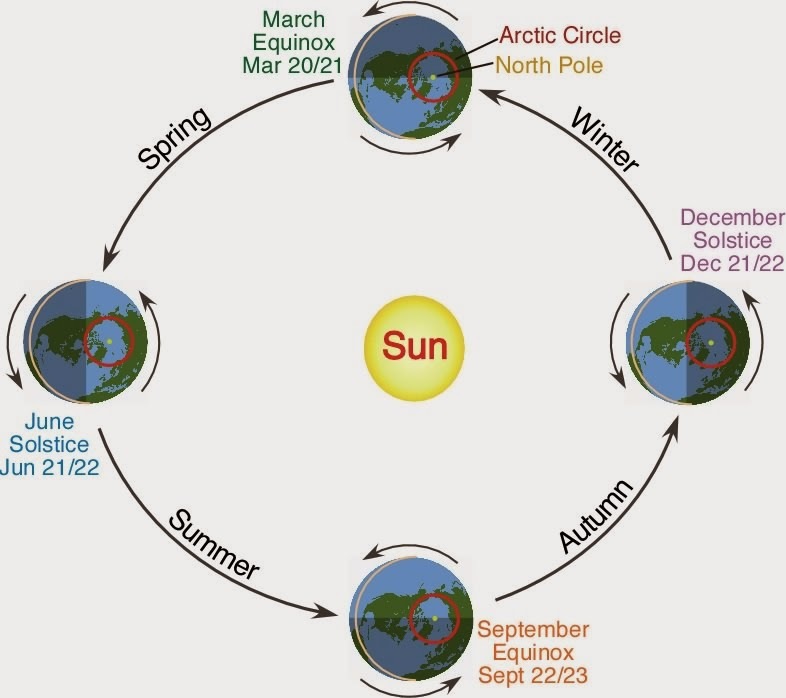 During this time the Northern hemisphere will have longest day and shortest night. ü On December 22nd the sun is vertically overhead of Tropic of Capricorn (23 ½ 0 S). This is called Winter Solstice. 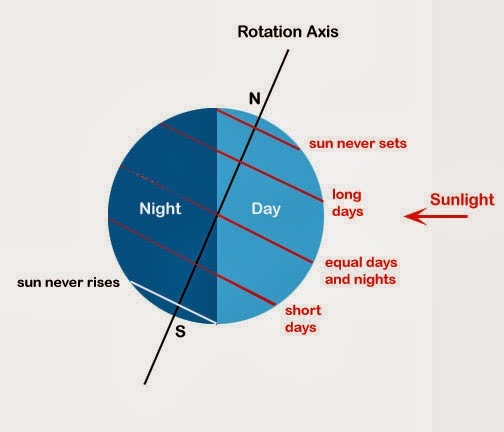 The southern hemisphere will have longest day and shortest night. 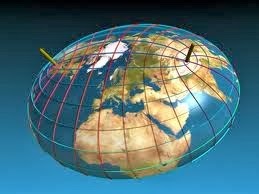 ü Latitudes are the imaginary lines on the surface of the earth. ü These are the horizontal lines from East to West on the Surface of the earth. ü This is the angular distance of a point on the earth’s surface measured in degrees from the centre of the earth. (North or South). ü There are 180 latitudes. 90 in the Northern hemisphere and 90 in the southern hemisphere. ü The latitudes are also called parallels. ü The each line of latitude is a circle. ü The lines of latitudes also known as circles of latitudes. ü The central line is called equator. ü What is a great circle? A great circle is a circle on the surface of the earth that passes through the centre of the earth). ü Reaming parallels are small circles. 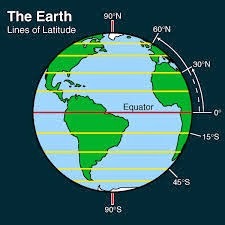 ü The equator has the latitude of 00.
ü The equator divided the earth into Northern and Southern hemispheres. ü Equator passes through Ecuador, Colombia, Brazil, Gabon, Congo, Uganda, Kenya, Somalia and Indonesia. 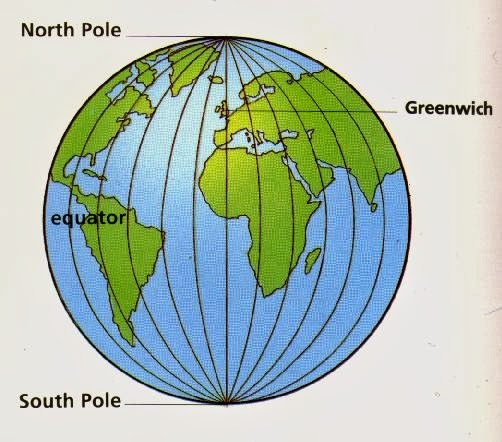 ü The North Pole has the latitude of 90 0 N.
ü The South Pole has the latitude of 90 0 S.
ü Longitudes are the imaginary lines on the surface of the earth. ü These are the vertical lines from North to South on the surface of the earth. 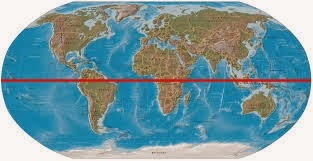 ü This is the angular distance measured in degrees along the equator. ü These are also called meridians. ü One of these is called Prime Meridian that passes through the Royal observatory, Greenwich, England. ü The Prime meridian is the 00 longitude. ü The prime meridian divides the earth into Eastern hemisphere and the Western hemispheres. ü There are 360 longitudes. ü There are 180 longitudes in the eastern hemisphere and the other 180 in the western hemisphere. ü All the longitudes converge at poles. ü The longitude that is exactly opposite to the Prime meridian is the International Date Line. ü This is a parallel. ü This is at 23 ½ 0 N of the equator. ü This is also known as the Northern Circle. ü This is at 23 ½ 0 S of the equator. ü This is also known as the Southern circle. ü This is at 66 ½ 0 N.
ü This is at 66 ½ 0 S.
ü Equator (Horizontal line): 00.
v The earth rotates 360° in about 24 hours, which means 15° an hour or 1° in four minutes. Thus, when it is 12 noon at Greenwich, the time at 15° east of Greenwich will be 15 × 4 = 60 minutes, i.e., 1 hour ahead of Greenwich Time, which means 1 p.m. But at 15° west of Greenwich, the time will be behind Greenwich time by one hour, i.e., it will be 11.00 a.m. Similarly, at 180°, it will be midnight when it is 12 noon at Greenwich. ü We know what the time is. ü We also know that the time is not same on all parts of the earth. ü It varies from place to place. ü This is because for the sake of convince the whole World is divided into 24 standard time zones. ü Each zone is separated by 150 longitudes. ü Larger countries (greater east to west stretch) have more than 1 time zone. ü Russia has 11 time zones. (Area wise Russia is the largest country). ü USA has 6 time zones. ü Canada has 5 time zones. ü Do you know how many time zones are present in India? ü Travelling from GMT towards east will gain time. ü There is a total difference of 24 hours between the two sides of 1800 meridian. ü At the International Date Line the date changes exactly by 1 day when it is crosses. ü The International Date Line passes through Bering Strait (Between USA and Russia), Fiji, Tonga and other islands. ü (What is a Strait? Strait is a narrow strip of water connecting two larger bodies of water). 2. The country with only one time zone. 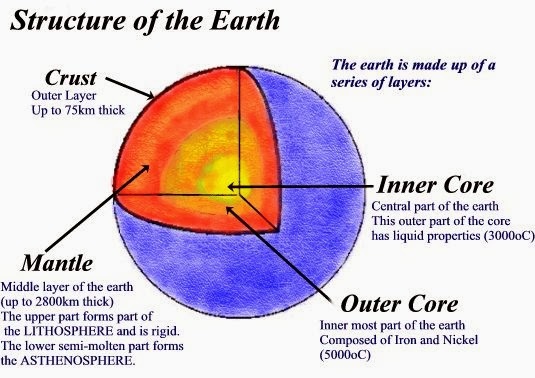 ü The Crust, the Mantle and the Core are the layers in the earth. ü The uppermost mantle along with the crust is called Lithosphere. ü The basis of differentiation of these layers is the density of the rocks in different parts. ü The Mohorovicic discontinuity, the Gutenberg discontinuity and the Lehman discontinuity are the transitional zones. Let us discuss about these layers in detail. ü This is the topmost layer of the earth. ü This is the thinnest layer of the earth. ü This layer has the least density. ü The thickness of this layer varies from 8 to 40 km. ü The lower limit of the crust is identified by the transitional zone called Mohorovicic discontinuity. ü The Crust is the most important part of the earth for human beings. ü The Oceans and the continents are situated on the crust. ü The thickness of the crust is less under the oceans. ü The thickness of the crust is more under continents. ü The thickness of the crust under the mountains is much more. ü The Crust is rich with the minerals like Silica and Aluminum. ü The crust is also called Sial. (Please remember this). ü What is Sial? (Si - Silica and Al - Aluminum). ü Oxygen is the most important constituent of this layer. ü Oxygen constitutes about 46.6 percent. ü The other important constituents are Silicon, Aluminum, Iron, Calcium, Sodium etc. ü The Basalt rock is available in the oceanic crust. ü The Granite rock is available in the continental crust. ü This is the intermediate layer of the earth. ü The mantle is about 2895 km thick. ü This is the thickest layer of the earth. ü The minerals that are present in this layer are in semi solid state. ü The mantle is also called Sima. ü What is Sima? (Si – Silica and Ma – Magnesium). ü The Gutenberg discontinuity is the transitional zone that separates the Mantle and the core. ü This is the innermost layer of the earth. ü The radius is about 3475 km. ü The innermost part of the core is crystalline. ü The core is the densest part of the earth. ü The inner core was discovered by Lehmann in the year 1936.
ü The temperature of the core is between 22000 and 27500 C.
ü This is rich in the minerals like Iron and Nickel. ü This layer is also called Nife. ü What is Nife? (Ni – Nickel and Fe – Ferrous).